Ann Lauer's Here Comes the Sun fabrics were recently featured in a three-piece project in the September 2017 issue of American Quilter magazine. She used the teal colorway to create a wall quilt, table runner, and placemats. See the projects below and read about how she used the sunflower stripe to create them. Why did you choose to make a set of projects for the magazine? I wanted to offer examples of how versatile the stripe is and how it could be used in several different ways. The stripe is so beautiful—the combination of the flowers with the delicate gold scrolls floating around the sides on that dappled background, and it has so much potential. The projects work well together—use the table runner with placemats, and hang the square quilt on the wall, or use it as a table topper instead of the runner. Tell us about the wall quilt. The quilt features fussy-cut squares. The four squares are not centered on the sunflowers; instead they’re positioned so the geometric section shows more on one point and less on the opposite. 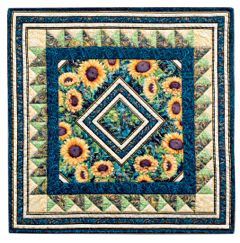 When you put the squares together, you have an on-point geometric center surrounded by sunflowers with a little geometric accent in outer corners. The border is simple to piece but showy, and it sets of the medallion center. Then I used the geometric part of the stripe as a final border. And the runner and placemats? I wanted to leave the stripe as is, to really show it off without cutting it. The runner has an easy checkerboard border, and the piecing on both ends is made from strip sets. The stripe in the placemat is set off with simple piecing as well. Do you have a favorite from this set? The runner. I really like the way the stripe plays with it. There’s enough piecing to make it interesting without overpowering. Click here to find the Good Morning Sunshine kit (magazine with pattern included). 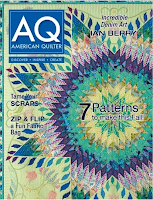 Click here to find American Quilter magazine. Want to see more from the Here Comes the Sun collection? Click here to see the entire fabric collection. Click here to visit Ann's website and see her patterns featuring Here Comes the Sun. Click here to read Ann's interview about the fabrics. 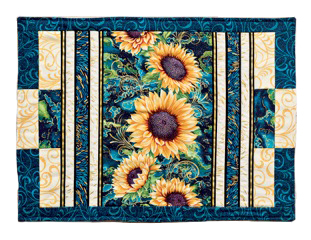 Click here to follow Ann's demonstration using the sunflower stripe. Best of Benartex Contest Voting! Oops a Daisy Free Pattern Friday! Enter our "Best of Benartex" Photo Contest!